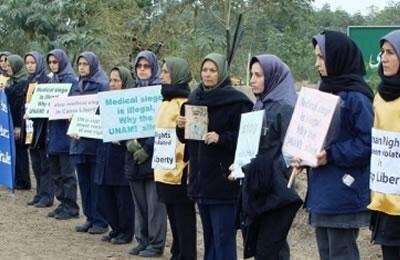 On Wednesday, December 10, dozens of Iranian women, members of opposition to the Islamic fundamentalist regime of Iran, in Camp Liberty marked Human Rights Day and held placards calling for human rights to be respected in the camp. The participants of this rally signed a letter issued by the protesters requesting UN High Commissioner of Human Rights Zeid Ra’ad al-Hussein to support human rights and international humanitarian rights violated by Tehran-loyal Iraqi forces. Iranian regime’s senior Ayatollah: Girls should marry while in high school!